Jaqueline Maria Pereira de Carvalho Endres is a volleyball player from Brazil born on December 31, 1983. She is the member of Brazilian club Minas Tênis Clube and also a member of the national volleyball team of Brazil. Having started playing for club team in 1999 followed by her national team debut in 2001, Jaqueline Carvalho has gone on to become one of the most successful and well-recognized female volleyball players in the world. She started her career with Osasco Voleibol Clube and has kept moving to different clubs over the years some of which are Rio de Janeiro Vôlei Clube, Scavolini Pesaro and Minas Tênis Clube. 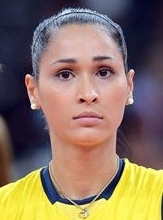 In her highly successful career as a volleyball player, Carvalho has become a double Olympic Champion, a double silver medalist of the World Championship and multimedalist of the World Grand Prix along with winning several more individual and team titles. A far as the personal of her is concerned, Jaqueline Carvalho is married to another Brazilian volleyball player Murilo Endres and the couple has one child together who was born in 2013. Below is the list of complete volleyball player Jaqueline Carvalho body measurements including her weight, height, shoe and bra size. At the 2010 FIVB World Grand Prix, she was given the award of Best Spiker. Her husband Murilo Endres is also a volleyball player. Jaqueline Carvalho is a two time Olympic Gold medalist (2008 and 2012).